Why use Polaroids in the classroom? I am a HUGE believer in using visuals when teaching. If you know me, you know that nearly EVERY single teaching resource I have ever created is packed with visuals. Pictures help students grasp difficult concepts with ease while making learning fun! If you have a Polaroid camera you can just snap a picture and have it ready for whatever activity you might need visuals for. Here are 20 ways you can use Polaroids in the classroom… starting off with September ideas all the way through to the end of the school year! Take pictures of students and have them write interesting facts about themselves in the white part of the Polaroid. Put the Polaroids up on display! Keep this up all year long! If you’re bad with names, taking a picture of your students and writing their name below will help you remember names a whole lot faster. I find that learning names as soon as possible is one of the best ways to get your classroom management off to a good start. 3. Use polaroids of students to label their coat hooks. This is another way to learn students’ names quickly and it also helps peers learn each other’s names! 4. Take polaroids of manipulatives/ games/ activities/puzzles (you name it). Stick the polaroids on the buckets or bins they’re in. Quick and easy labels, DONE! I love having labels that have real life pictures of the objects inside each bin. Use polaroids to show parents where students sit. You can use the same polaroid you took for # 1 or 2. Students create several scenes using plasticine/lego/toys. Students snap a polaroid of each scene – I suggest 5 pictures: one for the beginning, a few for the middle, and one for the ending. They can use the white spaces underneath for the writing part. This is a great way to get reluctant writers excited about writing. Also, since it’s not a text heavy writing lesson, you can zero in on specific writing techniques like including onomatopoeia (just one example) to make a story interesting! …and take polaroids of signs of changes in weather (ex., leaves falling and changing color). Adapt this idea to any science topic you are covering and use polaroids to document those scientific discoveries! Students take a polaroid of what they are thankful for and write about it underneath. Display polaroids on a bulletin board. 9. Get ready for Christmas and use polaroids to create some fun presents. Students snap a picture of their traditional clothing; foods; symbols; or anything that highlights their special celebrations. Students label their pictures in the white space! For instance, a student who celebrates Hanukkah might take a picture of a menorah and include a description below. Put these up on display! What a great way for other students to learn about all the cultures celebrated by students in their classroom, am I right?!! 11. Students take pictures of their goals for the new year and write their goals underneath. For example, if the goal is to read 100 books, the student might take a picture of himself reading. Display these on a bulletin board. Seeing the pictures up for the remainder of the year is a GREAT way for students to remember the goals they set for themselves. 12. Use polaroids to create Valentines gifts. One idea would be to take pictures of students with arms wide open but don’t get their hands in the shot. Use paper to ‘extend’ the arms in the polaroid even longer and write “I love you THIS much” on the polaroid. 13. Students take polaroids of people/places/things they LOVE. Use the polaroids to create a display of all the things students love. Keep this display up all year long, not just in February! Spring is a great time to get students outdoors while writing. Students can snap a picture of something that inspires them. A flower. A butterfly. The clouds. A puddle. Once they’ve taken their polaroid students can use the image to inspire a poem! Getting students in nature while writing is a fun way to spice things up a bit. As school draws closer to an end, I like snapping pictures of my students during fun activities (for example, in the summer we usually have an outdoor “Play Day”). I then add a note on the back of the picture and give it to them on the last day of school so they have a little keepsake from me. A polaroid is so perfect for this – I like how there’s room on the bottom with just enough space to write a short but sweet message! 16. Teach various text types using polaroids. For instance, procedural writing can be challenging but if students snap 4-5 pictures of the main steps in a procedure… writing the steps afterwards is a… snap (yes, pun definitely intended)! I have always loved getting students to use pictures when teaching procedural writing. Starting a new unit and need some word wall cards? Take polaroids of important vocabulary. For example, if studying shapes, take pictures of shapes and label the names underneath. Using visuals to teach new vocabulary is much more effective than simply putting up words without a picture clue. If you want to really reinforce new vocabulary try out a Spot It & Steal It Game (many of the games come with word wall cards too). I would just use polaroids to enhance my word wall even more! Like my Halloween example (#6), you can use polaroids any time of the year for any sort of story writing. Some students just hate drawing so taking a picture of a scene created with figurines/lego/toy dinosaurs (etc., etc.,) takes the pressure off. Plus, having the ideas all laid out there with visuals just makes the writing part that much easier. Doing an experiment? Need your students to label their observations? Have them snap a picture with a polaroid camera. They can stick the picture into their notebooks and label all their observations! You don’t want their inability to draw in detail to take away from all the possible observations they could have labeled – using a polaroid helps with this!! Get students to practise descriptive writing by getting them to create a wanted poster. First, they snap a picture of a person or object. Then they stick the polaroid onto a poster. They will use the image to help them describe (in DETAIL) the missing person, animal, or object. It might be a scruffy dog or a brand new shiny bracelet that has gone missing. Taking a picture just makes the wanted poster a bit more real, plus it makes descriptive writing MUCH more fun! My “Boring Words Synonym Booklets” are a great way to get students to write more descriptively as well! 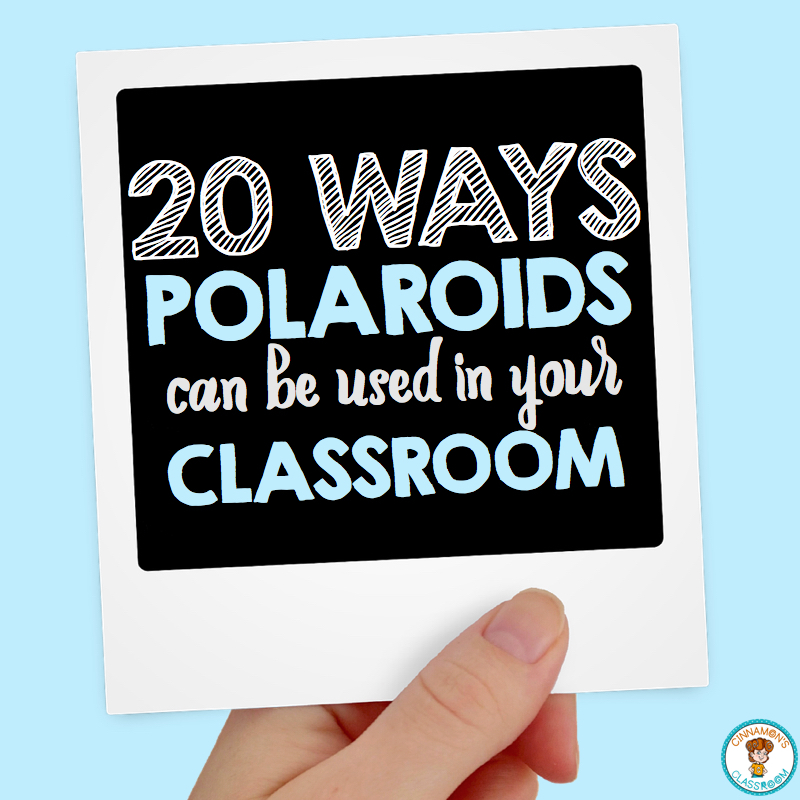 Well there you have it… 20 fun ways to use polaroids in the classroom. I could have gone on and on… there’s no end to the possibilities! !